Prototype: German Federal Railroad (DB) class 44 heavy steam freight locomotive, with an oil tender based on the type 2´2´T34 tender. Black/red basic paint scheme. Transitional wartime cab with only one window per side, standard design Witte smoke deflectors, pilot truck wheel set with spoked wheels, without smoke box central locking, with an inductive magnet on one side. Road number 44 1746. The locomotive looks as it did around 1961. Model: The locomotive has a 21-pin digital interface. It also has controlled high-efficiency propulsion with a flywheel, mounted in the boiler. 5 axles powered. Traction tires. The locomotive and the oil tender are constructed mostly of metal. The 7226 smoke unit can be installed in the locomotive. The triple headlights change over with the direction of travel. They and the smoke unit that can be installed in the locomotive will work in conventional operation and can be controlled digitally. Maintenance-free warm white LEDs are used for the lighting. There is a close coupling with a guide mechanism between the locomotive and tender. There is a close coupler with an NEM pocket and a guide mechanism on the tender and on the front of the locomotive. The minimum radius for operation is 360 mm / 14-3/16". Protective sleeves for the piston rods, brake hoses, and imitation couplers are included as detail parts. Length over the buffers 26 cm / 10-1/4". 21-pin digital decoder digital interface connector included. The four-axle type Erz IIId hopper cars to go with this locomotive and for transporting iron ore can be found under item number 24129 as a display of 12 cars with different car numbers in the Trix H0 assortment. Another 24 cars with different car numbers can be found in the Märklin H0 assortment under item number 46210 with specifications for the required DC wheel sets. 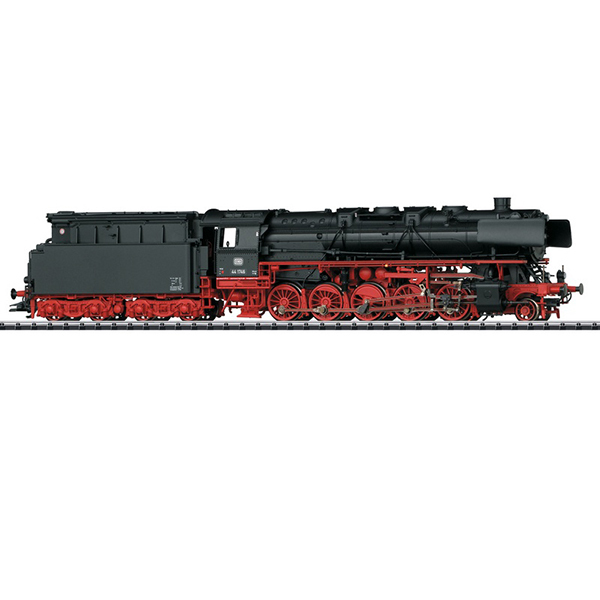 This model can be found in an AC version in the Märklin H0 assortment under item number 39882, however with an mfx digital decoder.